To form it's unique composite fiberglass and aluminum hardtop, Atlantic Towers ATL 6 system utilizes a one piece welded aluminum frame, with the perimeter formed of a custom ATL 6 extrusion. 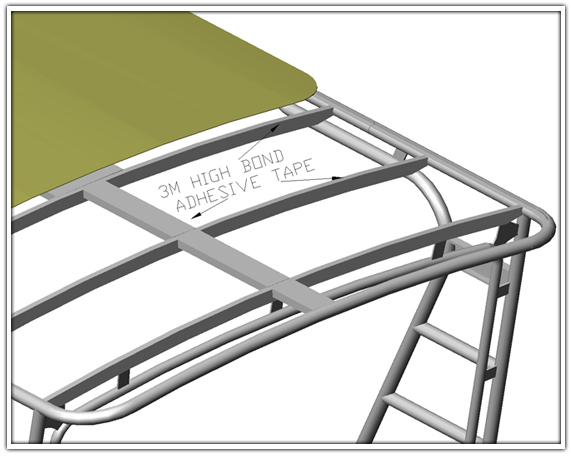 The ATL 6 extrusion can be formed into any perimeter hardtop shape. Once the perimeter shape is formed, side to side roof reinforcing beams are added. The beams, or carlins in nautical terminology are formed from rectangular aluminum extrusions. The photos below, show both extrusions as they are joined to form the structure of the hardtop. To provide for the mounting of equipment, such as Radar, searchlight, hailer, etc. Atlantic Towers ATL 4 extrusion runs the length of the hardtop on the centerline (click here for ATL 4 details) Typically the leading edge of the hardtop matches the shape of the boats existing windshield or flybridge cowl. This allows a clear plastic enclosure (by others) to fit almost perfectly flat between the lower attachment at the boats windshield and the new Atlantic Towers Custom Hardtop. While enclosures can be attached to the hardtop using studs or snaps, Atlantic Towers recommends that an extruded aluminum or plastic track system be used. This track system can be supplied by your canvas/enclosure fabricator, or as an option it may be installed by Atlantic Towers. The ATL 6 extrusion presents a flat "inside" surface to allow easy installation of the track using screws or pop rivets. Once the welded aluminum hardtop frame is complete, a thin, flexible and light weight one-piece panel of fiberglass is cut to fit into the recess in the top of the ATL 6 extrusion. After cutting and fitting the panel is washed, and then bonded and screwed to the hardtop frame. The panel is bonded to the carlins and center reinforcement of the hardtop using a 3M industrial adhesive on a foam core. Around the perimeter of the hardtop the fiberglass is secured in the extruded ATL 6 notch with closely spaced stainless steel screws. The edge is then sealed and the screws completely hidden by RTV (room temperature vulcanizing) silicone rubber. Once bonded in place these fiberglass panels have withstood hurricane winds in excess of 100mph.